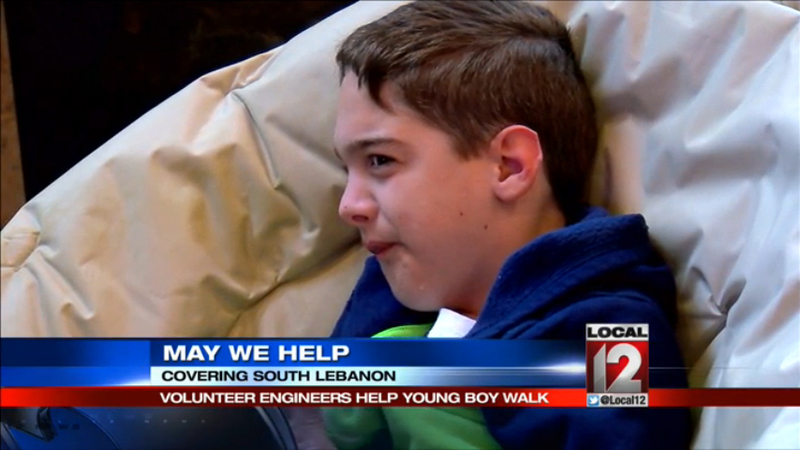 CINCINNATI (Liz Bonis) — “May We Help” is a group of local volunteers who are mainly engineers. They build stuff that otherwise would not exist for those with disabilities. They invite people to a special dinner to show their support because the stuff they build free to families who need it is life changing. Perhaps no one knows that more right now than little JJ who’s just 9-years-old. JJ was born with Bainbridge Ropers Syndrome. It’s a genetic condition so new it only recently got its name. The symptoms make it hard for JJ to control his legs or walk. Evaluating JJ’s needs has been a work in progress, the team originally came in and began by building a stand for JJ. It had simple straps around it that they could put around his waist so he could stand up. But he needed something more so engineer Ellen built what she called a gait trainer. It literally helped train his body to walk. She felt called to volunteer with May We Help. Ellen said, “I have a sister with disabilities and it’s just always been my passion to help.” Ellen’s passion has given JJ a whole new world. JJ’s hands hit the silver and activate it on, he then walks and a remote control can stop it. JJ’s progress is pretty amazing. Ellen said the strength he’s gained isn’t just in his body but his spirit too.